My mother grew up in the Depression on a small farm on a plot of land now absorbed into Houston. She was by long habit frugal with family food and given to meticulous planning, even if my father’s income no longer required these precautions. Hence the four nights of meatloaf. First night: Fresh from the oven, the new meatloaf was deliciously juicy, the aroma sweetly filling the air, calling us from our rooms. Usually there was sauce (Campbell’s Cream of Mushroom). 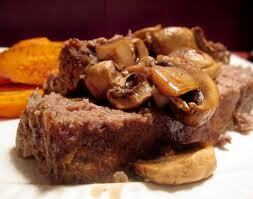 The meatloaf was melting-soft and comforting, with hidden sparks of onion, celery, sometimes bright specks of carrots. If not a meal for kings, at least princes. Always mashed potatoes too, a warm mound with a tiny golden pond of melting margarine. Second night: Reheated meatloaf. Sometimes not reheated, but simply there on the plate, quite dense now, more brittle than tender, with a gray-brown tinge. Dull flecks of vegetables whose tastes had dimmed beyond detection. The mushroom sauce would be finished, replaced by catsup’s slightly-tomato taste covering bland slightly-meat memory. Lunch would have been meatloaf as well, slightly moister, between two slices of white bread. So here was a replay of the replay. Third night: Spaghetti with meat sauce. Crumbled up meatloaf in canned tomato sauce. A new lease for the meatloaf, now quite dry but at least tomato-infused back to softness, if not to the now lost and forgotten meat taste. The pasta could be twirled, at least, so that was a diversion. It’s a gray day. The Martin Luther King March this morning was cold and long, with bright, warm spots of groups along the road handing out cookies and hot chocolate and cheer. I’m thinking of meat loaf — the sweetness of the first night.